Towards the end of 2016, following the release of Tabletop Wargames – A Designers’ & Writers’ Handbook (which I reviewed here) we ran a competition on the podcast to give the book away, the only proviso being that the recipient write post for the blog with their thoughts on the book. Jon Yuengling won the book, and has very kindly written an article for the blog. I received this book after taking part in a contest to receive a wargaming book that you were asked to read and than review. This was done through the good graces of Meeples & Miniatures. A fine group of guys that are only looking to make the hobby better, as am I. 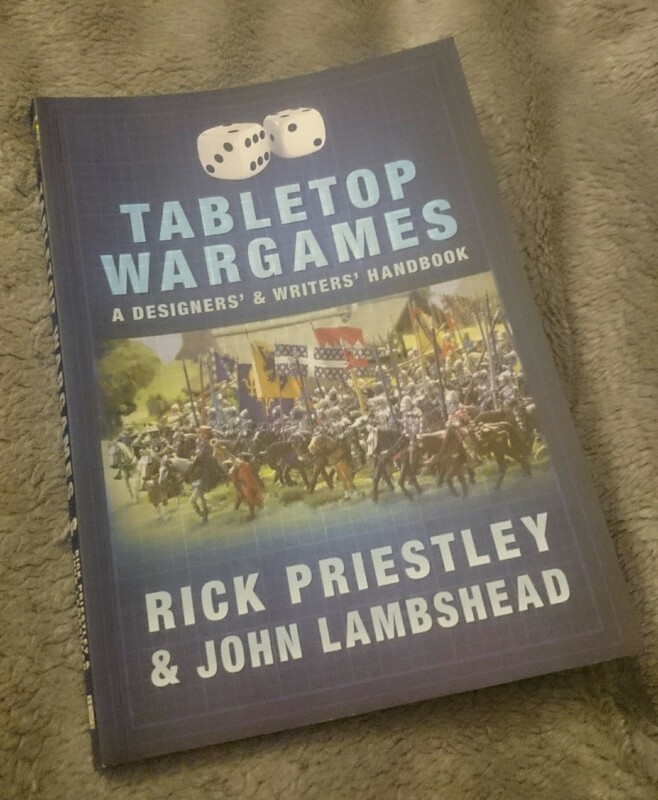 So Neil sent me the book, Tabletop Wargames – A Designers’ & Writers’ Handbook by Rick Priestley & John Lambshead. Perfect, I thought, I have penned a few pieces for Avalon Hill, Hasbro, TOOFATLardies and Solway Crafts and Miniatures. And what wargamer does not think of themselves as game designer, myself having done work with Clash of Arms, Hasbro and TOOFATLardies. So it is clear that this is a good book for myself and most in the community. From a production stand point this is first class. The layout by Pen & Sword is professional and the images are perfect offering eye candy to the reader and helping to reinforce the written materials. Unfortunately I found the writing style to be incredibly stilted with paragraphs going on and on, offering little to support their initial thesis. This in itself could have been corrected by a good edit of the materials. I assume this presentation was done in a particular voice for a reason, a reason that escapes me. Leaving the writing style aside, I want to go over what was interesting and what I found lacking in a book that in the title declares itself to be a designer and writer’s handbook. This book of nine reasonably short chapters covered our history, dice, presentation, skirmish games and future expansions and campaigns. All worth while, but missing includes fun – the reason we do this, cards vs dice, leadership, friction, support from clubs and companies and choosing a period for your miniatures. I was concerned that aircraft and naval games received scant mention. An introduction from someone else in the industry would have been a great addition. I was able to think of at least three luminaries in the hobby that Rick Priestley could have asked. I found this handbook to be wanting and wish to give a few examples of what went wrong. For specifics starting on page 92 we have “Respect” – “Remember that the reader is a fellow human being who is making an effort to engage with what is written.” I agree that we need to keep the reader in mind and to ensure we are delivering on the promise. If I buy a set of miniatures rules for combined arms and find that the artillery rules were slapped on at the last minutes I will be upset. Yes respect your audience. But also respect the readers of this book. If you are offering a handbook on gaming in 2016 please offer either reference materials on how to be a writer or designer OR show how a wide variety of writers and designers have been successful in the past. On page 89 we have Aerial and Naval Combat Games. This section received a total of two and a half pages and the condensed version is do not write these types of rules because they are too difficult. It appears that taking a tanks or an infantry platoon in combat on the table is easier as there is less technology involved. So I assume Wings of War and Harpoon to name just two successful aerial or naval games is just a fluke. My answer is that you design what you like and make it fun for you and your gaming buddies but always remembers your audience. If you are the Captain of the carrier in a Harpoon game you make Captain level decisions, you already know your men are putting the right ordnance on the aircraft for the mission. With page 143 we look at bean counting. “Wargames are about competition, conflict and high drama. Logistics is about bookkeeping and traffic management.” Well not really. Is having a limit of grenades, torpedoes or artillery shells really hard when dealing with logistics in combat. If my plane drops it bomb or torpedo I know I need to return to base and reload. If my 1863 regiment is in combat for hours I will at some point have to return a portion of my force to rearm. This is done by many old and cleaver means, “Oh no I rolled three “1”s I am out of ammo.” This also brings an additional level of realism for many players. We look at law on page 114 the Law of Diminishing Returns. According to this law games are less popular if you are not playing Germans or I assume Russians or Americans. Well the British were not part of this rule as shown, but the French are only 25% as popular. As this is a law I am sure it is on the books somewhere, but not at a Napoleonic’s club. Yes I am sure they mean World War II but think about it, if there is no interest in Italy, France, Romania or Poland why is the Flames of War family selling armies for these countries. There is no Law of Diminishing Return as long as you design good rules for interesting periods and scenarios. If I am correct with this, you can make an argument for games and systems that call for the fast BT-7 even though there is a small window for 1941 Barbarossa (or also Khalkhin Gol but who wants to play the Japanese, that is you believe in this law). On page 118 we look at availability of models. The authors are right it is frustrating to design a scenario or even rules if you do not have figures or vehicles available, but you are the creator of your universe. Chose wisely and ask around. There are a number of designers out there that can make plausible 3D models of most tanks, trucks and armoured cars. An additional chapter should have been included in networking with clubs, sculptors and miniature manufactures. If you are interested in something there are bound to be other interested parties. A chapter on Social Media and game designers would not have been out of place. It is surprising what is both missing and over used. We are missing a glossary, always useful in a reference book. It would have been nice to see more of the classics in the reference section. As a reader, I find it in bad taste to quote yourself in your own work. A handbook could use appendices to look at smaller subjects in greater detail. As for over used a wider assortment of successful game systems as examples would have been nice including quotes from the designers. Lastly, if you made it this far, we do need a reference book for new designers out there, but this is not it. A book for our hobby has to focus on fun over looking for an award winning game system because designers need to have fun with their project, as they will be spending a lot of time with it. If you enjoy history, a good story and miniatures take a crack at designing your own system.